Starting top left, clockwise: Good Doggy, Death of Marat, The Republic, and Versailles. I got too excited to use the palette and forgot to take pictures before I besmirched the beautiful pressed shadows, but it’s obviously been loved so far! 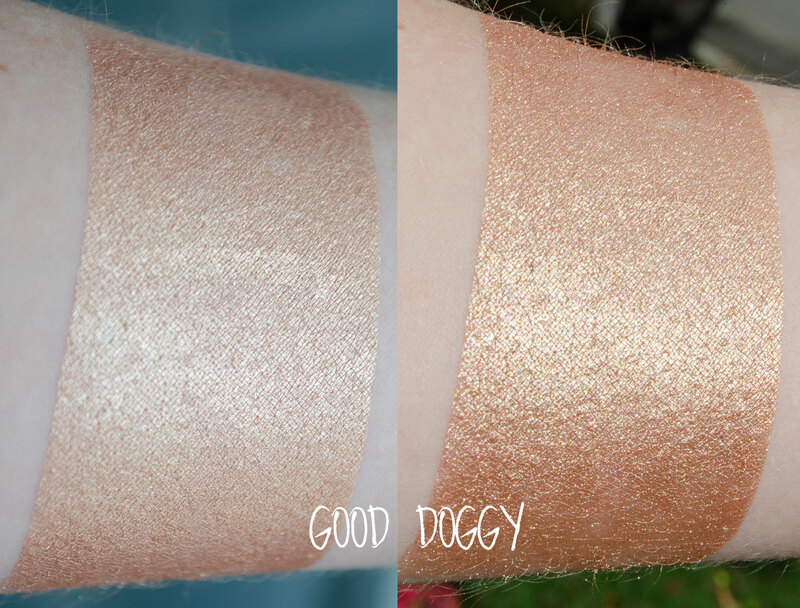 Good Doggy is from the A Heart is a Heavy Burden collection, and is a luminous pale peach with a cold/coppery sheen to it. This shadow, like all of the shadows, had excellent pigmentation. In the swatches above, the shadow is applied over Urban Decay Primer Potion over the top half and Darling Girl Glitter Glue over the bottom half, and as you can see the shadow performed just as well without a sticky base. It also applied very smooth/creamy! As a taupe addict, it should come as no surprise that I’ve had one eye on Death of Marat since Baroque Cosmetics came out with the Viva La Revolution collection in June. It is described as a ‘creamy oatmeal with a soft blue flash’, and I would have to agree exactly with this description. Applied on the lid it looks quite silvery, with perhaps a slight bit of plum to it, which I think comes from the combo of the pale brown with the slight amount of blue. THIS SHADE IS SO BEAUTIFUL. I can’t even begin, ugh. It also performed equally well over regular primer as it did over the sticky base. Aw man, Versailles is STUNNING. 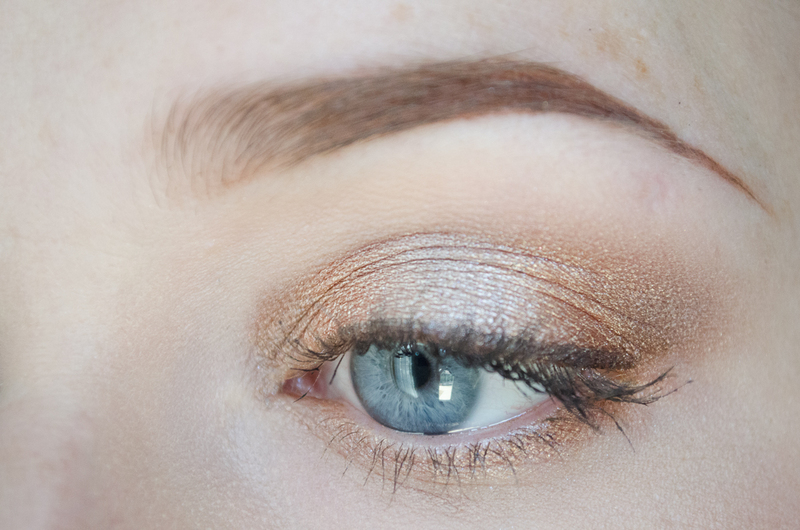 I used this in my last post for the Cleopatra look, so you can already see how intense it can be when applied. 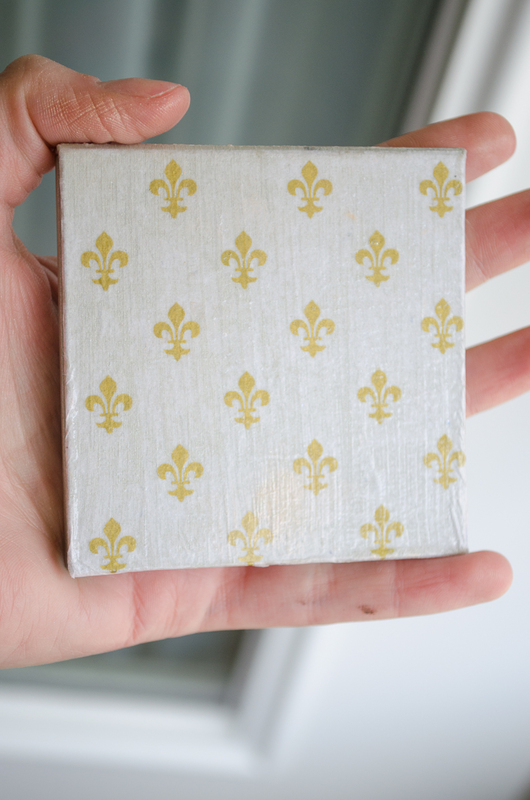 It’s gold with a blackened base, and the color has a lot of personality to it. It’s quite regal and very shiny, like burnished gold. I think this perfectly embodies the opulence and grandeur that was Versailles at its height. The Republic is a great foil to Versailles! 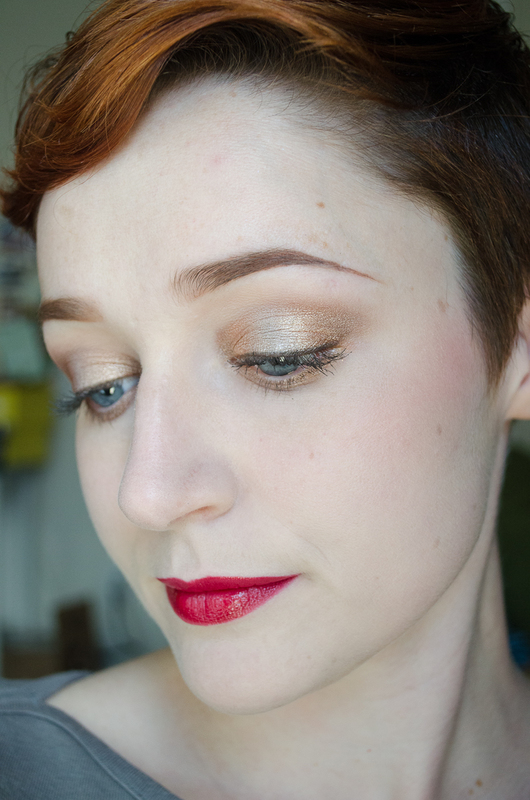 Though not matte by any means, the shimmer in this shadow is much more understated than the previous three. It is a darker, warm brown with what appears to me to be tones of gold and perhaps a little red. It blended very well with the others, and added a lot of dimension to the look. I did not formally order from Andi, so I can’t speak to turn around time from pressing send on an order to arrival, but I did receive my gorgeous little package four days after she messaged me about it. This is the same as her advertised turn around time in her shop (1-4 days), which is VERY fast for indies. Andi was super on top of her communication with me (and an absolute sweetheart to boot), all of which leads me to feel confident that anyone ordering from Baroque Cosmetics could rely on receiving their package in a very timely manner, well packaged, and with terrific customer service. 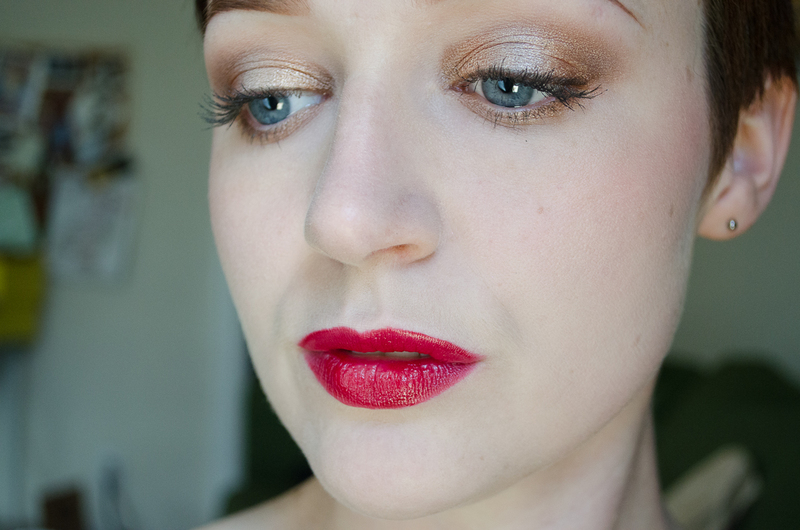 Because I used Versailles in my Cleopatra look, I wanted to give the other three shadows a spin. I used Death of Marat on the center of the lid over just a little bit of NYX milk, Good Doggy just out from that, and The Republic on the inner and outer corners and slightly blown out on the crease. I also used Death of Marat and Good Doggy along the lower portion of the lid as well. All of the shadows are just applied over NARS Smudgeproof primer. These shadows played super nicely with one another– they blended very easily, but weren’t so soft that they instantly became muddy. I really like how the silver of Death of Marat contrasts with the peach of Good Doggy. Their pigmentation was excellent, even being fairly light colored shadows (excepting The Republic, which also had excellent pigmentation). 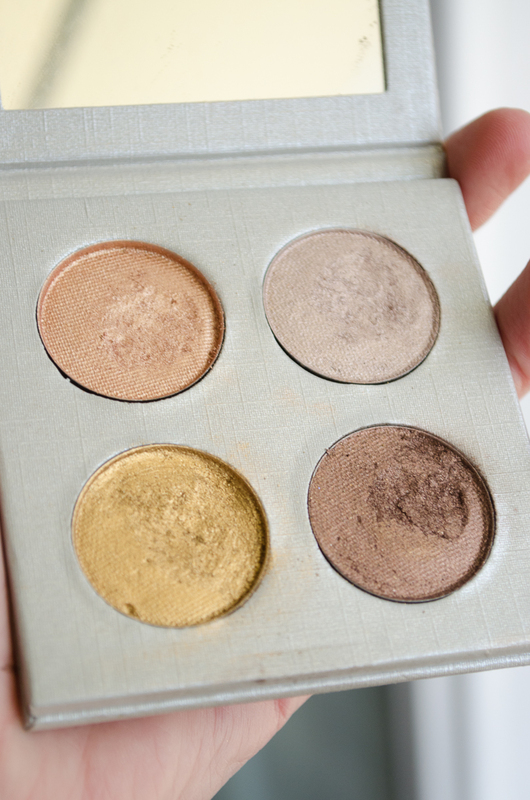 I love how luminous they all look– their shimmer is very fine and looks almost glowy. 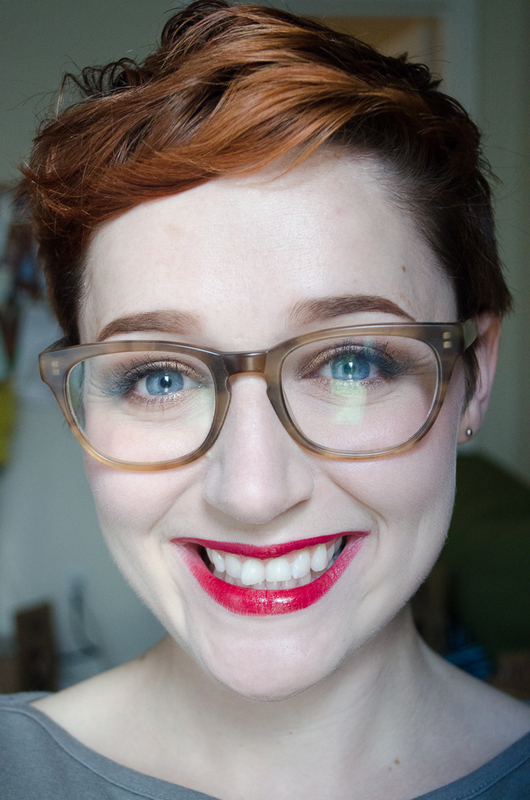 This was a great opportunity to use my Notoriously Morbid One Helluva Lover lipcraft lip gloss from last month’s Vanishing Cabinet… UGH it is so beautiful!! 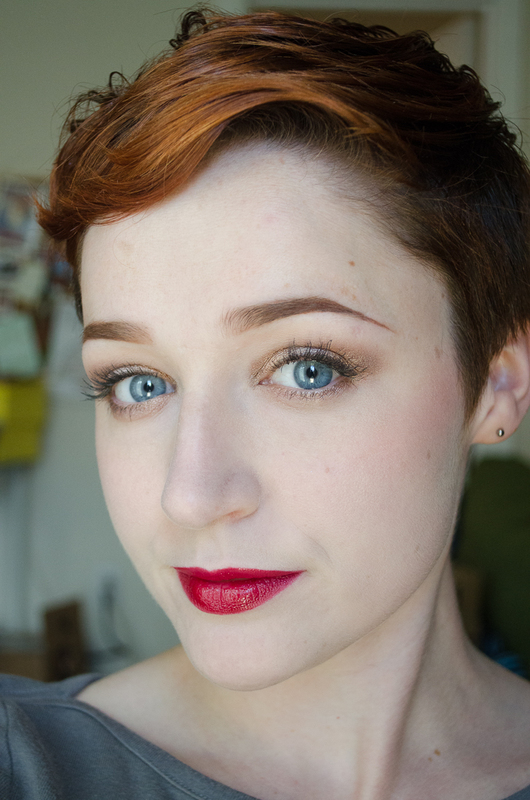 I applied it over Sephora’s red nano lip liner (a lip liner I am not super fond of, but it works well enough that I’ll use it until I can’t anymore), just to give some definition to the outline of the lips. This gloss has some real lasting power. It’s three hours later after having eaten lunch and it’s still going strong! (Though not quite as glossy looking). This is my first experience with a Notoriously Morbid lip gloss and I am impressed. It is super pigmented and the formula isn’t very sticky. One Helluva Lover is a really terrific shade. Dramatic, really classic looking. I love you Frank N. Furter. 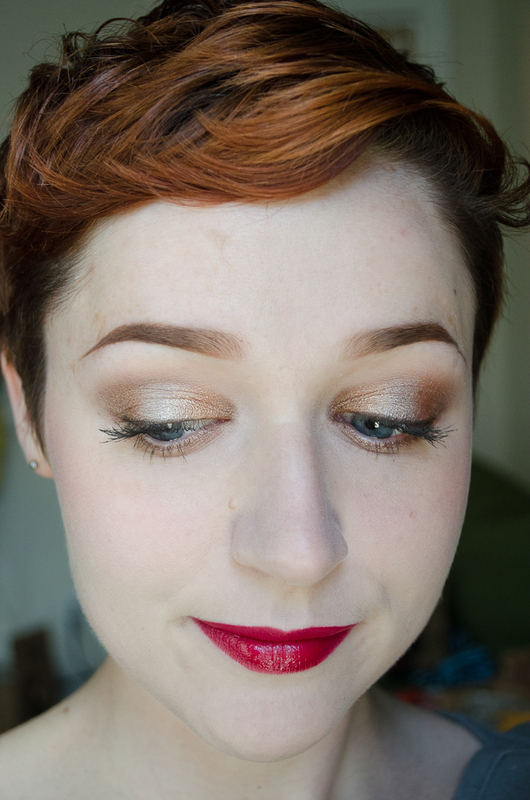 Fyrinnae Greek Goddess is making another appearance today– I can’t get enough of this blush. I know that Fyrinnae’s cart is sometimes up and down and we’ve all experienced website issues sometimes, but believe me folks, they are so worth it in exchange for the ability to use a blush as great as this one. It looks so insanely pink in the jar, but turns into the most beautiful flush. 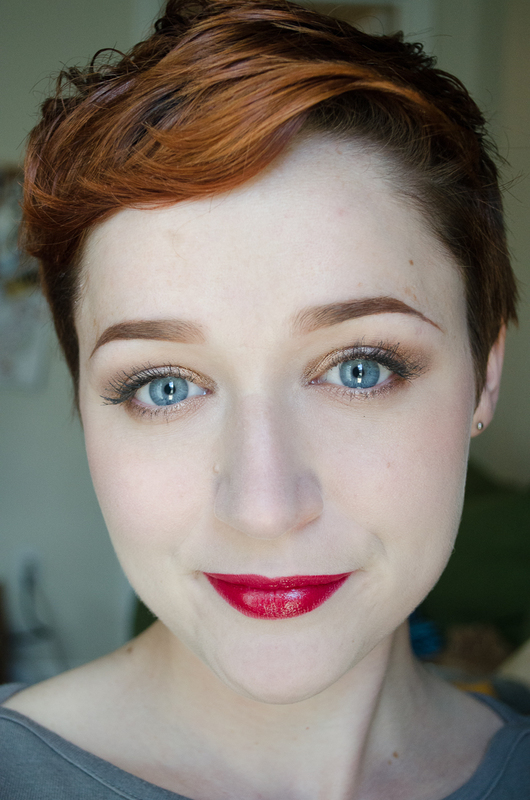 Neutral eyes and bright red lips will always be a classic, but indies make it feel just that much better, I think! 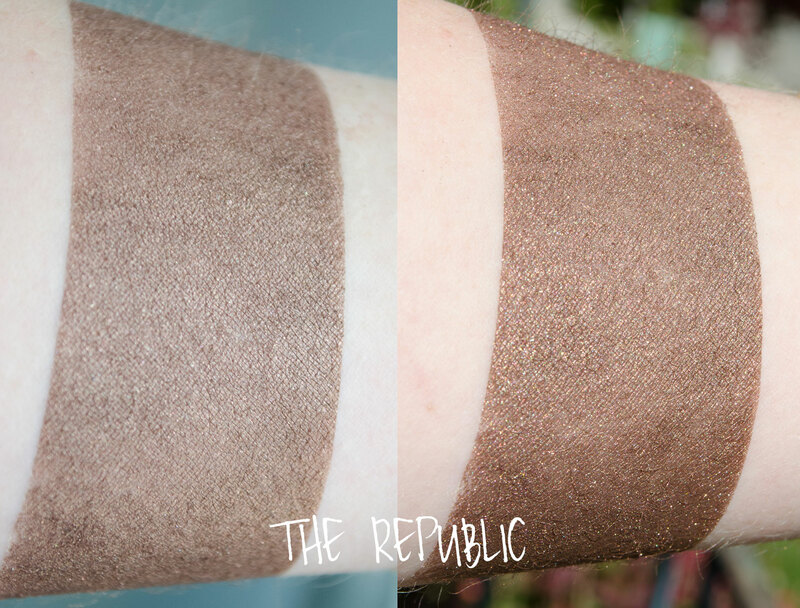 First and foremost, I am VERY impressed with Baroque Cosmetic’s shadow pigmentation. I don’t use shadows without any sort of primer, but I do typically expect there to be a measurable difference between application over a regular primer and over a sticky base. All four of these shadows performed equally well over both, so much so that I didn’t bother to use a sticky base in my actual look. I also appreciate that these colors are all neutrals to some degree, but they each are very unique. 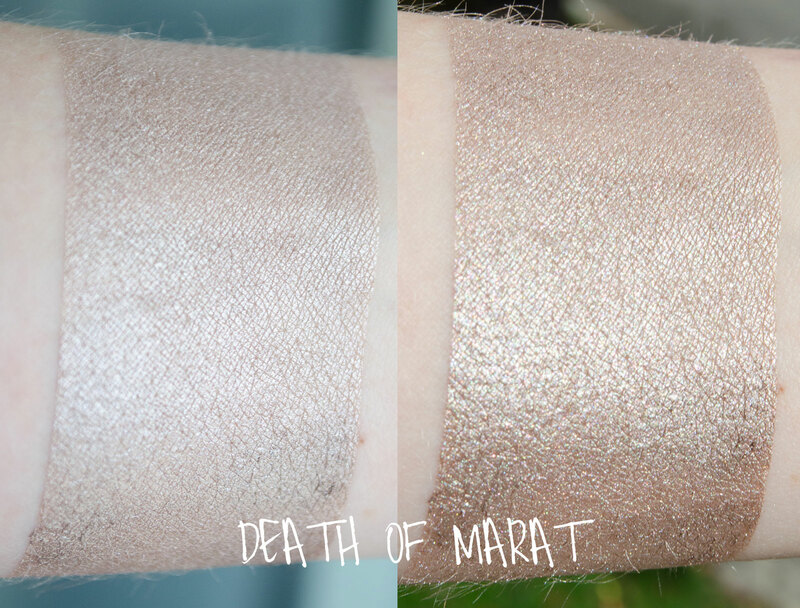 None of my other indie shadows are quite like Death of Marat, and though I own a lot of peach colors Good Doggy still sets itself apart with its strong copper undertones. 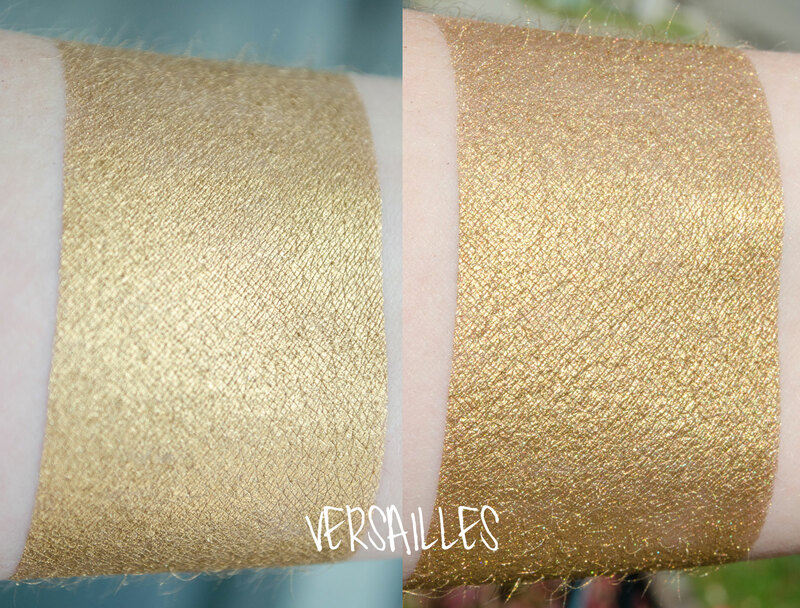 I do have other golds and browns, but the blackened base of Versailles is very sophisticated and The Republic blended really well with the other shadows, which not all dark browns do. Looking over her other collections, I love that she has a range of neutrals and brighter colors to choose from– I think this gives options to everybody. The shadow quality is terrific and the forumulation is great! For me, the person behind the company is also important, and Andi is a very thoughtful person and deserves to have that be known! This shadow quad was a thank you gift, for which I am immensely grateful, and think it’s important to note her generosity. Thank you again, Andi!! I am always enthusiastic about trying new companies, but it’s especially exciting when that company’s products are absolutely fantastic. Baroque Cosmetic shadows are $1.50/sample, $6/full size, with discounts when you buy full sets of either size. Blushes are $1.50/sample, $8/full size… I have my eye on those in particular, I think I’ll be picking up a sample set to try out! I’d Hate Toulouse You (oh ho ho ho) looks like it would be phenomenal for the Christmas season. Have you had a chance to try Baroque Cosmetics yet? If someone created another historical collection, what would call to you? Please note that this quad was provided to me as a gift, free of charge. This review was unsolicited and my opinions of the shadows provided in this blog post are unbiased, and have not been influenced by the providing shop, or any other parties. I love that in the end, the shadows match your glasses!